Benjamin F. Bobo was born in 1852 at Ohio, USA. Benson Bobo Book: The Bobo Family History, Draft Manuscript, Revised June 1990 byCharles Henry Bobo, page 3-5 states that Benson is buried next toGabriel and Matilda Bobo. His military stone identifies him as in Co.B, 141 Ohio Infantry. Anise Wison, Gabriel's grandaughter, says thatBenson contracted typhoid while in the Army and was hauled fromCincinnati to Albany (Ohio) in a wagon. He reached home alive, butdied soon after. He was unmarried. As of 19 February 1799,her married name was Hewitt. Betsey Bobo married Israel Hewitt on 19 February 1799 at Ohio, USA. Catharine Bobo was born in 1844. Charles E. Bobo was born in 1858 at Ohio, USA. 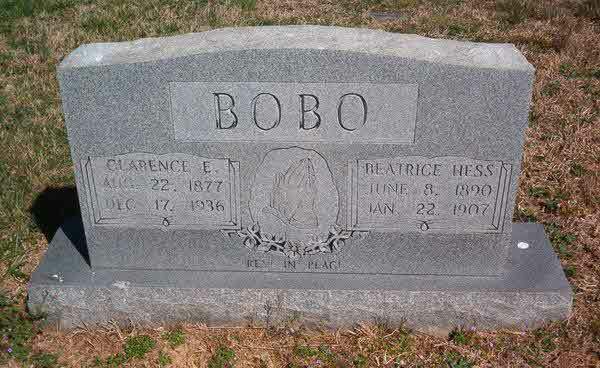 Charlotte Bobo was born in 1838. She married Charles Hutson on 13 October 1856 at Vinton, Ohio, USA. Her married name was Hutson. Her married name was Akers. Charlotte Bobo was born in 1836. David S. Bobo was born in February 1845 at Ohio, USA. He died in 1909. He was buried at Lee, Athens, Ohio, USA. Donnie B. Bobo was born in 1899. Effie Bobo died in 1909. Elias Davis Bobo was born on 10 February 1858 at Berryville, Carroll, Arkansas, USA. He married Mary Frances Boyd on 11 February 1884 at Carroll, Arkansas, USA. Elias Davis Bobo died on 21 February 1930 at Berryville, Carroll, Arkansas, USA, at age 72. He was buried at Carroll, Arkansas, USA. Elihue Bobo was born in 1846. Eliza Bobo was born on 31 October 1842. She died on 18 September 1918 at age 75. She was buried at Carroll, Arkansas, USA. Eliza C. Bobo was born in 1850. She died in 1860. Elizabeth Bobo was born in 1799. She married Reason Gabriel in 1814. Elizabeth Bobo Notes of Roberta McKenzie: Census1820 Athens County, Ohio- 2 m under10, 1 f 10-16, 1 m 20-30, 1 f 20-30; Census 1830 Athens County, Ohio-1 m 40-50, 1 f 30-40; 1840-1850 Champaign County, Illinois; 1860 BooneCounty, Indiana. Her married name was Gabriel. She died on 3 March 1863 at Athens, Athens, Ohio, USA; Named after Athens, Greece; home of Ohio University. Elizabeth Bobo was born in 1802 at Ohio, USA. She married Jonathan Brine on 15 June 1820. Her married name was Brine. Elizabeth J. Bobo was born in 1860. She Apparently died as a child. She was 5 months old in the U. S. Census1860. Ella Bobo Land records show that Henry and Susan Bobo had deeded six acres ofland to Bert and Ella Bobo Mankey shortly before Ella's death. Ellaand her husband were building a house for themselves when Ella diedduring the birth of their first child. The house was never finished.This story is attributed to Mrs. Jenola McKibben of Zaleski, Ohio. Ella Margaret Bobo was born on 24 August 1882 at Vinton, Ohio, USA. She died on 16 June 1937 at age 54. She was buried after 16 June 1937 at Madison, Alabama, USA. 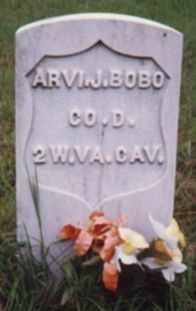 Ernest Irvine Bobo was born on 25 December 1906. He died on 13 December 1980 at age 73. Ezekiel Bobo was born on 10 September 1804 at Ohio, USA. He married Sara(Sally) Wren on 8 April 1825 at Athens, Athens, Ohio, USA; Named after Athens, Greece; home of Ohio University. Ezekiel Bobo married Margaret Brown on 4 June 1873 at Vinton, Ohio, USA. Ezekiel Bobo died on 26 August 1885 at Vinton, Ohio, USA, at age 80. He was buried at McArthur, Vinton, Ohio, USA. Floretta Bobo was born in 1848. She married Volney Blower on 21 August 1870 at Vinton, Ohio, USA. Floretta Bobo Marriage Record : Floretta Bobo married Volney Blower 21 August 1870,Vinton County, Ohio, Vol. 3, Page 30. Her married name was Blower. Frances Bobo was born in 1840. Francis Marion Bobo was born in 1852 at Vinton, Ohio, USA. He married Matilda Littrel on 2 June 1872 at Carroll, Arkansas, USA. Francis Marion Bobo died on 21 February 1930 at Berryville, Carroll, Arkansas, USA. He was buried at Carroll, Arkansas, USA.